This is a collection of books, periodicals, and charts pertaining to the Adventism movement in Protestant Christianity. Originally housed at the Berkshire Christian College in Lenox, MA, the collection moved to Gordon-Conwell in 1987. Here you can find prophetic charts, Millerite/Adventist periodicals, church records, and a library of 2,500 volumes about the doctrines, practices, and history of the Advent movement. Adventism was founded in the 1830s by William Miller, a farmer and Baptist preacher in eastern New York State. Miller preached that the world would end on October 22, 1844, based on his interpretation of a numerical prophecy in the book of Daniel. Though Millerism spread widely, the movement ended in the “Great Disappointment,” when the day in question came and the end-times did not come. Remaining adherents reorganized into a variety of splinter churches. The largest of these was the Seventh-Day Adventist Church, formally established in 1863. 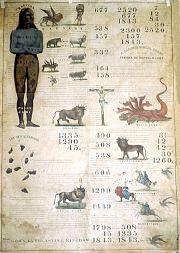 Pictured here is an 1843 chart from the collection, depicting the prophecy in Daniel 2:31ff, which was central to the tenets of Adventism. Visible is the statue made of four metals as described in the text, alongside numerical calculations. US Jews and Israel: Are we headed for divorce? We are always dropping news and events on Facebook, along with important cross-registration updates and BTI Consortium announcements. If you want to be in the know, then Facebook is the place to go for the BTI. If you enjoy this newsletter then check us out on our social channels below. We distribute newsletters approximately every two weeks on Monday morning during the academic year. The deadline for the next newsletter is Thursday, April 18 at noon . Email btinews@bostontheological.org to submit an event or announcement.